Last night while I was trying to figure out what to have for dinner, I discovered 2 packages of mushrooms hidden behind the lettuce. Apparently I forgot I bought them the week before. For some crazy reason I thought of meatloaf with a mushroom gravy. It was crazy because I usually only make meatloaf once every 6 or 7 years. I’m NOT a fan. Boy did that ever change! I found a great recipe while looking for something else. (Isn’t that always the case?) But the best part of this recipe was the sauce. I embellished it with mushrooms since they were the reason for making meatloaf in the first place and if I can be honest, I used quite a bit more roasted garlic in the sauce than it called for; maybe 15 to 16 cloves. What?? Isn’t garlic supposed to be good for you? Yes it is. Besides, once roasted it’s super mild but huge in flavor. I worked on the sauce while the meatloaf baked since they take about the same amount of time to cook. And in between all that, I peeled some potatoes and started them boiling for the mashed potatoes that are simply a MUST with a dish like this. To round out the meal I had a bag of beautiful whole carrots and had just picked up some fresh radishes at the store and thought they would be great roasted together. (which they were). I peeled and trimmed the carrots and trimmed the radishes then tossed them in a little olive oil, adding a bit of salt and freshly ground pepper. They roasted in the oven at 400º on a rimmed sheet pan for about 20 to 25 minutes after the meatloaf was finished and resting on the counter. (Why yes, the meatloaf was covered loosely with foil). 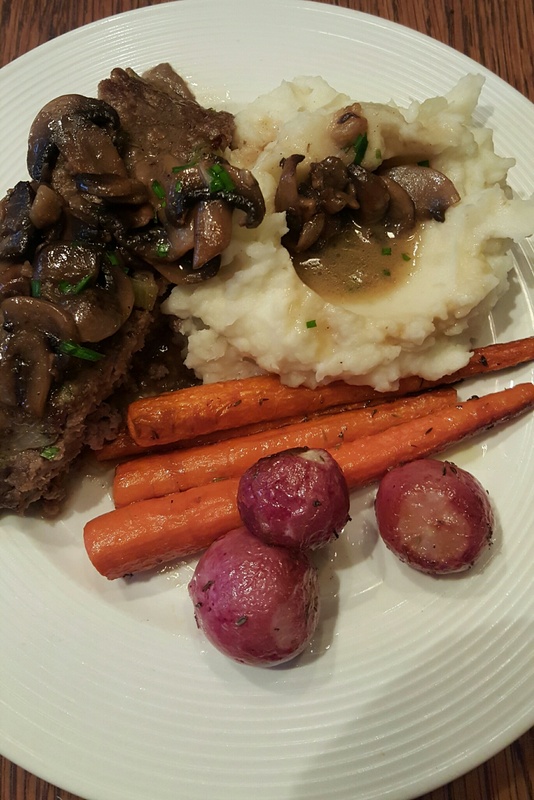 If you would like to try this recipe, here is my adapted recipe for the meatloaf. I hope you enjoy it. And don’t forget to go check out the original recipe too. (I just didn’t have all the ingredients, hence the adaptation). The link is after the recipe. Heat the olive oil in a large (12-inch) sauté pan over medium heat. Add the onion and celery and cook for 5 to 7 minutes, stirring occasionally, until the onion is translucent but not browned. Set aside to cool slightly. Place the beef, parsley, thyme, chives, eggs, milk, salt, pepper and bread crumbs in a large mixing bowl. Add the onion mixture to the meat mixture. With clean hands, gently toss the mixture together, making sure it’s combined but not compacted. Combine the oil and garlic in a small saucepan and bring to a boil. Lower the heat and simmer for 10 to 15 minutes, until lightly browned. Be careful not to burn the garlic or it will be bitter. Remove the garlic from the oil and set aside. (I save the oil for vinaigrettes or brushing on pizza dough.) When the garlic has cooled, I give it a rough chop so it will blend more in the sauce. Add 2 tablespoons butter to a large sauté pan. Once melted, add the mushrooms and sauté for about 5 or 6 minutes. Combine the chicken stock, butter and cooked garlic in with the mushrooms and bring to a boil. Lower the heat and cook at a full boil for 35 to 40 minutes, until slightly thickened. Whisk in 1/2 teaspoon salt and 1/4 teaspoon pepper, and taste for seasonings. Spoon the warm sauce over the meatloaf.